On Thursday, the group debuted their first project, recorded partly in Eric's bedroom at his parents and partly at his residence at UW. Production for the project was handled by AMFM and collaborator Occidental and stands out as one of the strengths of the EP. Wait Like Five Minutes represents a jumping off point for the duo. It shows a lot of potential for the future with the first seven tracks. The gems of the EP are unquestionably "Untouchable," which combines a Biggie hook, clever wordplay, and superb production, "Roll to the Left," a track which offers a more distinct Seattle flavor, and the fast-paced "CAPS." My only qualms with the project are the general typical sound of the EP and the questionable inclusion of the last two tracks. It's easy to see where the group draws it's influence, on many of the tracks they (intentionally or not), emulate the sound of local groups KnowMads, Blue Scholars, and Common Market among others. I understand that this is the groups' first project and they're still trying to find their own unique sound and style (something that can be difficult in this industry). Even Eminem struggled to find his own sound on his debut Infinite and was accused of copying AZ and Nas' styles. On the tracks that I mentioned above, the group starts to move in their own direction, but we'll have to stay tuned to see what course they take. As for the last two tracks, I question their necessity to the EP. The album feels as though it ends on (a high note on) the seventh track, but the eighth track, "Roof Jam," though containing some choice lines (Need something fat, grab the pad to roll on it/ Got Tails chasing me like I'm playin' old Sonic), it also demonstrates the groups relative inexperience. Instead of trading bars or verses or rhyming individual words together for emphasis (as is the style of groups like the Beastie Boys, Run-DMC, and Dyme Def), at times the group makes the mistake of simultaneously rhyming whole lines, causing them to be unintelligible (but to be honest, this is the only track I didn't like on the EP). As for the final track, there's not much rhyming on it and instead features the emcees telling a comical story about their first incidental meeting, not necessarily a bad inclusion, but it still feels tacked on after the seventh track. 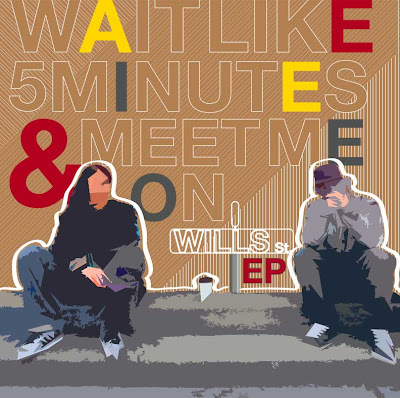 Wait Like Five Minutes isn't flawless, nor would it be fair to expect it to be, but at the end of the day it represents a very solid debut for a group that, as the name implies, may very well play a large role in the next generation of NW hip hop. The good more than outweighs the bad--there definitely are some cuts on the album--and it's more than worth the price of admission. The EP can be downloaded/streamed for free here. Good head on my neck, good heart in my chest.